Nutrition is very important for elementary aged children, as eating good, balanced meals helps them grow strong, stay healthy, and learn at maximum capacity. If your child is eating their meals at school, it can be more difficult to pack nutritious foods for them that will last from the morning to lunch time. A great solution to this predicament is to have your child eat meals from their school cafeteria! The elementary schools in the Denver area offer some awesome breakfast and lunch menus for their students. We have taken a look at the menus at the public elementary schools in Aurora like Dalton Elementary School, Vaughn Elementary School, and Elkhart Elementary School to create this guide to help you talk to your child about making healthy choices in the school cafeteria! The elementary schools in Aurora offer a daily breakfast menu consisting of a main dish, two fruit sides, and assorted beverages. Fruit is an excellent addition to your child’s breakfast, as the natural sugars will give them a little extra boost of morning energy while the vitamins will contribute to their overall health. Encourage them to choose a fruit side with their breakfast! If your child has braces, they should choose a soft option, like a banana or diced peaches, instead of chewier options like craisins or melon. Some of these choices include eggs or meat, which contain great protein to fuel your child’s day. However, if pastries are the only option, be sure to encourage them to eat an extra healthy lunch with proteins and veggies to make up for their sugary breakfast. When it comes to selecting a beverage, plain milk is the best choice for building healthy bones and teeth! If your child doesn’t like milk, encourage them to choose water instead of sugary juice. There is also a turkey and ham sandwich and a turkey sub that is available at lunch every day. This is a great staple for your child to choose, with protein that will keep them full throughout the afternoon. These lunch meats and the bread should also be soft enough for your child to eat if they have braces. There are several sides offered each day, with at least one fruit and one veggie option at each lunch. Be sure to encourage your child to choose and eat at least one vegetable option with every lunch. If you child doesn’t like the veggie option offered that day, consider packing something that you know they’ll eat! Options like steamed broccoli and peas are great choices for students with braces. 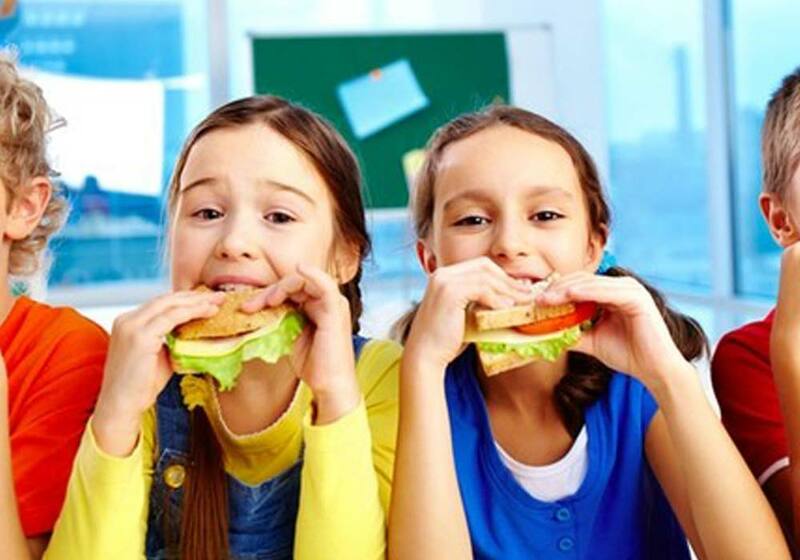 Your elementary school student has plenty of tooth-healthy options available for them to choose from when eating meals at their school cafeteria in Aurora, Colorado. If you have any questions about your child’s oral health and diet, schedule a consultation with us today!